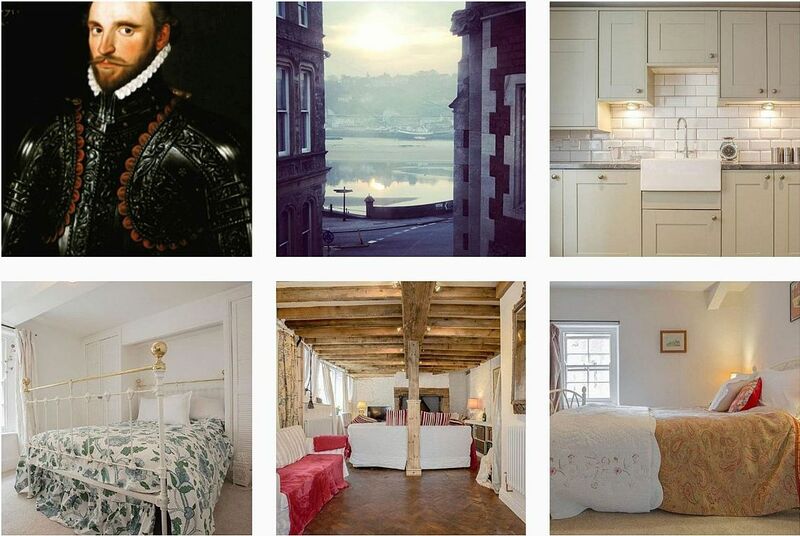 Historical 17th-century family town house, with original timber beam, is perfect for a long weekend away with beautiful walks on the Tarka Trail only 5 minutes away. Place House is a unique Grade II listed semi-detached holiday home with stacks of history and character. This is not your run-of-the mill, holiday cottage but it is the setting for a memorable holiday experience. Place House was the birth place of Elizabethan naval hero and explorer Sir Richard Grenville. This beautiful Grade II house has gone through a number of incarnations since its construction in the early 17th-century as the Grenville’s family home. The large timber beam on the ground floor dates back to the original build. It was probably imported from Canada and still bears the cargo marks that were used as a tally system by the shipmen. Remodelled internally during the 19th century and subsequently turned into a very popular public house (note the stiletto marks on the ground floor! ), the pub was more recently divided into three separate residences, of which this house is one. Sir Richard Grenville is one of the country’s most celebrated naval commanders, whose fearless, and suicidal, naval campaign during the Spanish Armada resulted in a hero’s death at the Battle of Flores in 1591. Grenville, who was born in this house in 1542, is also believed to have sent the first colony to America. Ideally situated in a central location with estuary glimpses, this delightful house, refurbished in 2018, will appeal to history buffs and those with a penchant for the quirky and unusual. Place House is perfect for an alternative family get-together, intimate gathering of friends, writers retreat, or a romantic weekend break. Place House has been furnished with the hope to provide you not only with a bespoke luxury holiday experience, but a bit of personality and charm too. There is plenty to see and do on your doorstep with the famous Tarka Trail less than 5 minutes’ walk away for walking or cycling. Take time to meander around the many delightful shops, pubs and restaurants that the town has to offer. Bideford also has a regular pannier and water front markets, all within a 5 minute stroll of the house. Take a boat trip to the nature reserve at Lundy Island, or explore many pretty fishing villages, including nearby Clovelly and Appledore. Instow is just 3 miles and is a pretty, unspoilt, seaside village with large stretches of sandy beaches and dunes. In addition, you will find fishermen’s cottages, shops and a good selection of pubs and restaurants specialising in locally caught seafood. The wide golden sandy beach of Westward Ho! is popular with surfers, and is just 3 miles with Saunton, Croyde and Woolacombe all close by. With so much to discover in this lovely part of North Devon this is your perfect holiday choice. Beach 3 miles. Shops and pub 50 yards, restaurant 20 yards. Living room: With wood burner, Freeview TV, DVD player, selection of books, double sofa bed (for flexible sleeping arrangements), beams and wooden floor. Gas central heating, gas, electricity, bed linen, towels and Wi-Fi included. Logs for wood burner available locally. Stairgate. Welcome pack. Public car park, 200 yards, £3 per day, £16 per week. No smoking.